When we create a page on the social network, we do not think about the people around her availability. Over time, the communication would be desirable to keep in touch in the circle of people with the same interests. 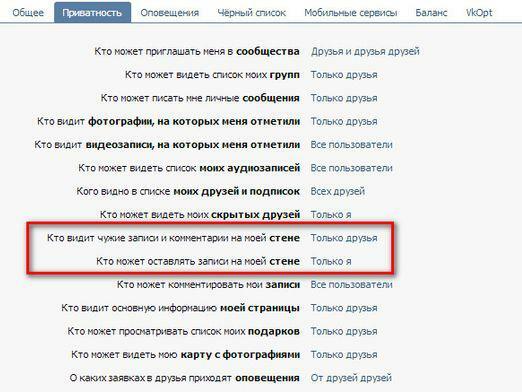 Therefore, we are looking for opportunities, how to hide wall VKontakte from prying eyes. To hide the wall of the outside attention, enough in the settings page to conduct the appropriate changes. But you need to remember, that your page is completely in contact data will not hide, since it is a social network with public access. Restrict reading his wall only group, friends or friends of friends. To make the necessary changes, go into “settings” and perform the following manipulations. In the settings menu, select the “Privacy”. Look for “Who sees the records on my wall” and the “Who can post on my wall”. From the options, select the appropriate check box and leave the opposite. After completing all the steps, click on “Save”. After your wall system introduced revisions hide from the outside attention. It can be accessed by a search, but to read and comment on other people's records people can not. This method edition page visibility allows you to communicate in social networks, without thinking, how to hide wall VKontakte from outside attention.